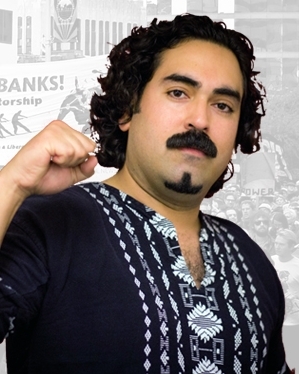 Frank Lara, is an activist, public school teacher, Mission District resident and candidate of the Party for Socialism and Liberation and Peace and Freedom Party for the 12th Congressional District of San Francisco. Frank has been very active in the struggle for justice, including the Occupy, anti-war, anti-police brutality and housing rights movements. He is running against establishment leader Nancy Pelosi on a socialist platform that speaks for the rights of all workers. End all evictions and foreclosures – Housing is a right! Money for health care not warfare – health care is a right! End NSA spying. Stop prosecuting whistle-blowers! Unlike the two major corporate-backed parties, who run candidates that don’t represent the interest of the 99%, our candidate, Frank Lara, is a community organizer and activist involved in a wide range of issues. Being involved in the major social movements in the US, Frank has helped organize and lead marches and protests demanding the end to US wars to making the banks pay for the economic crisis. See this photo presentation to see all the political issues dealt by the Lara 4 Congress campaign. The Lara for Congress campaign would like to hear from you.